Historically, however, many of these stories were originally intended to be read by both children and adults alike. Furthermore, these stories, in their original forms, were valued by the European peasantry for their ability to convey truths about rural life. Although not always pleasant, these truths helped prepare children for the realities of adult life—including the inevitable death of one’s parents, and the fears associated with budding sexuality. Despite the hardships these stories portray, they were designed to provide children, ultimately, with a sense of optimism, and confidence in their ability to navigate the trials of adulthood. By contrast, “Disneyfied” versions of these stories are devoid of their darker elements, and by extension, are less accurate portrayals of what its like to grow up. 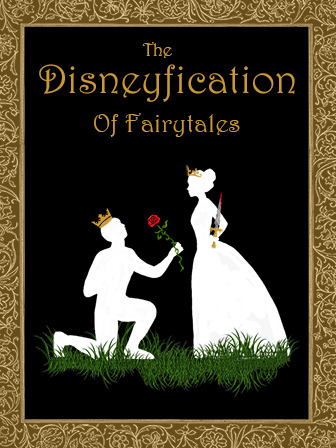 This piece discusses the implications of Disneyfication, and compares and contrasts the plots of original fairy tales with their “Disneyfied” counterparts. Some examples of the stories discussed are “Cinderella,” “Sleeping Beauty,” “The Little Mermaid,” and “Snow White,” among others. The German poet Friedrich Schiller once said, “ Deeper meaning resides in the fairy tales told to me in my childhood than in the truth that is taught by life.” Based on your own experiences with fairy tales, how do you feel about Schiller’s quote? Do you agree or disagree with him? Why or not? What, if anything, have you learned from fairy tales? Write your answers down. In this piece, “Disneyfication” is described, in part, as the process of converting a story into a “safe” form of entertainment. What is gained by sugarcoating these fairy tales, and omitting gruesome details? What do you think the original writers hoped to convey to children and adults alike with these original stories? Although fairy tales are less popular today than they were in the past, many people argue that modern fantasy and sci-fi books share many similarities, and express the same human fears and desires. Choose a fantasy or sci-fi book or film, and compare it to a fairy tale of your choosing. What are the similarities, and what are the differences? Do you think these different genres have more in common than what appears on the surface? Why or why not? This Link provides teachers with a number of different lesson ideas, and class activities, to compare and contrast myths, folktales, and fairytales. This link will help students see the value inherent in fairytales, assuming they don’t already see it.